Info "Locate the piece of building material that completes the pyramid structure!" 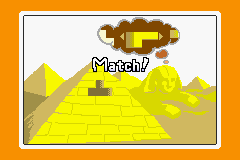 Sphinx Hijinks is a microgame found in the IQ folder in WarioWare, Inc.: Mega Microgame$! The objective of the game is to choose the right block that will match the hole on the wall to complete the pyramid. If the player chooses the wrong shape, that chosen shape will crack the pyramid upsetting the sphinx and losing the microgame. 1st level difficulty: There are three different shapes to choose from. 2nd level difficulty: There are four different shapes to choose from. 3rd level difficulty: There are five different shapes to choose from. This page was last edited on September 19, 2018, at 18:07.